When you can arrange flowers in 5 minutes and they look like this, why would you ever spend more time? Actually, come to think of it, I bet these arrangements took less than one minute each. Why not treat yourself? a few extra blooms floating in a bowl. sure the blooms are pretty and smell divine but feast your eyes on the colour of those leaves. Just perfect. An apple tree puts to shame all the men and women that have attempted to dress since the world began. HM Beecher. 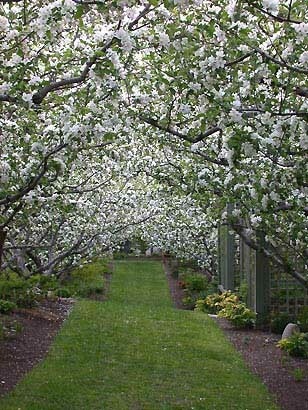 An incredible allé of apples at Elysium Gardens in Kelowna, BC.